To every woman who gave birth to every taxpayer and citizen of this nation, we have fought for everybody else’s equal rights. It’s our time to have wage equality once and for all, and equal rights for women in the United States of America. The remarks got some notable reactions in the hall from other women actors, but when Arquette was asked about her remarks at later events, her statement was picked apart and held up for scorn in many quarters. She took to Twitter to expand on her comments. And most of the criticism focused on her "politically incorrect" commentary, suggesting that she should not put aside the rights of the LGBT community or people of color in order to get women ahead. Many denied that women have had to step aside for the rights of others. Feminist blogs called her remarks "cringe-inducing," and conservative Fox News declared itself appalled, with contributor Stacey Dash quoting selectively from a John F. Kennedy speech to say that Arquette needed to "do her history." So yes, let's do our history. During the Civil War, many women, including [suffragette Elizabeth Cady] Stanton, had willingly put aside the fight for women’s rights to campaign for the emancipation of the slaves. After the war, they had even stood by patiently when, in 1866, Congress passed the 14th Amendment, defining citizens specifically and solely as “male” — the first use of the word “male” in the Constitution. The politicians soothed the women’s rights advocates by assuring them their turn would come soon. Stanton, among other women, expressed frustration because women had fought for civil rights for all groups, not just themselves, and so they felt betrayed after they were cut out of legislative protections, a scene that was repeated over and over in the decades to come. During the black civil rights movement in the 1960s, no less a figure than Rosa Parks noted that women's rights were never a consideration. In England, the suffragette movement stopped campaigning completely in favor of the war effort in World War I. Even the JFK speech on the Equal Pay Act cited by Fox News noted specifically that women had not been included: "[O]ur journey is not complete until our wives, our mothers and daughters can earn a living equal to their efforts.” The fact that people are still campaigning today for both the Equal Rights Amendment and equal pay laws stands as testimony to the omission. In making her brief statement, Arquette was reminding us of our history, and the facts. In her later tweets, she echoed Stanton and noted that women are a part of all the other civil rights fights, yet legislation giving them equal rights and wages proves elusive still. She noted that "women" is a group that includes LGBT women and women of color. But the reactions were decidedly negative in most quarters. 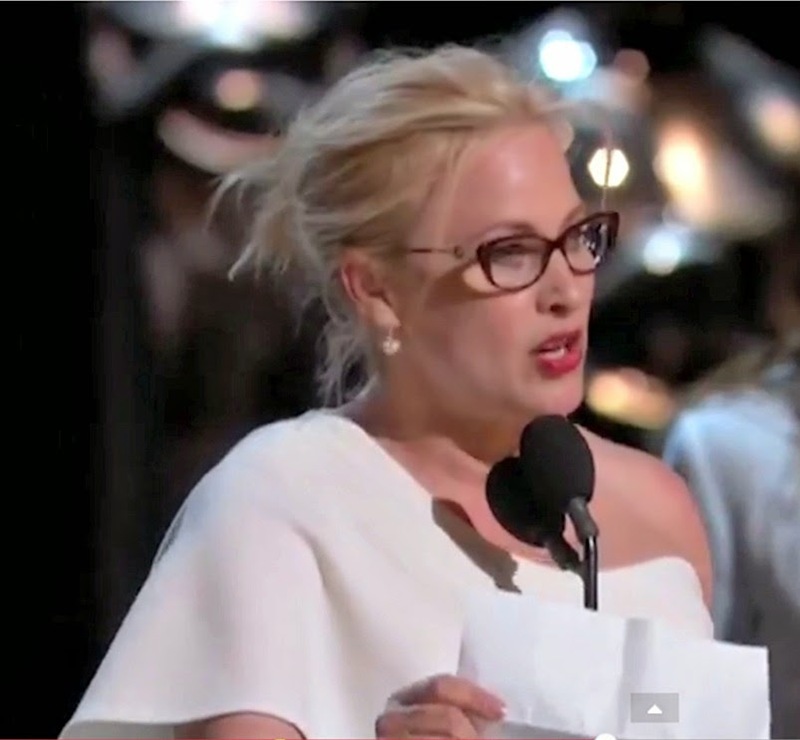 Both male and female commentators singled Arquette out for scorn for everything from her remarks to her use of notes, and praised the male speakers more than the women on their Oscar turns. Writing on Daily Beast, Lizzie Crocker was among the few to point out feminists' criticisms and note of Arquette's speech that "Hers was a sensible, plainly worded speech. Nowhere did she imply that she was not fighting for equality for everyone." Crocker went on to call the commentary "a low point for punditry." And later in the week, Hillary Clinton praised Arquette's speech, talking about wage and other inequities for women in the workplace and elsewhere. Don't waste your moment: With a world spotlight on her, Arquette understood the opportunity to make a forceful statement that was relevant to her industry--the audience before her--and the nation. As the Wall Street Journal points out, the gendered wage gap in Hollywood looks a lot like the one you and I experience, so her remarks were sure to resonate in the room as well as beyond it. Remind us of what we've forgotten: Bringing us back into history to shed light on what's happening today is just one of many useful roles speakers can play. Arquette's point had feeling behind it based on her own experience and observation, in addition to her sure stance in historical fact. Speak for women: Arquette used part of her remarks to redefine women as those who "gave birth to every taxpayer and citizen of this nation," and to make a crisp, quotable demand for their rights. So should we all. For myself, I wasn't at all surprised by the reactions. Here's why so many women hesitate to speak publicly, or to speak strongly when they do: They suspect, accurately, that they will face the condemnation--silent or otherwise--of both men and women. This is a very public example, but certainly not the first. 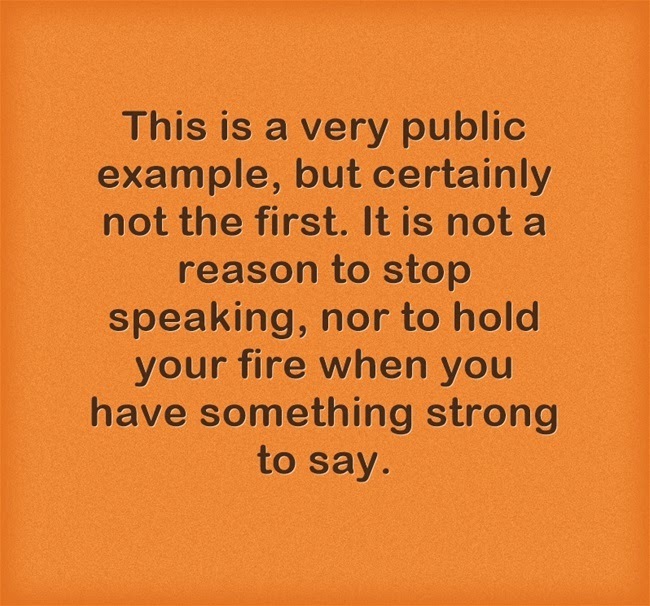 It is not a reason to stop speaking, nor to hold your fire when you have something strong to say. You can be aware of the expected condemnation without letting it (or yourself) silence you. I've had many discussions on this very point in history over the years with my friend Carolyn Kitch, who chairs the journalism department at Temple University. Kitch also specializes in American studies and women's history, so when I heard Arquette's remarks, I heard the echoes of history in them. I'm grateful for Kitch's insights on this volatile but important topic, which help me play a role in reminding you about our history.